It takes 24 hours by bus to get to Kyiv from Prague. I was lucky — our bus was half empty and all passengers had two seats and some even had four seats as I did. This was great as it meant I could stretch my legs across the aisle and sleep all night. Well, almost all night. A passenger in front of me reclined his seat as far back as he could so I was fully pinned to my seat in rather unpleasant proximity to the man’s sniffing. I cursed the one who invented reclining seats and believe they may be the cruellest innovation ever invented for travel in comfort. I politely asked man if he could put his seat back and he screamed back to me that he can do whatever he wants and strangely enough, only when he realized I was not Ukrainian he moved his seat back to a normal position. 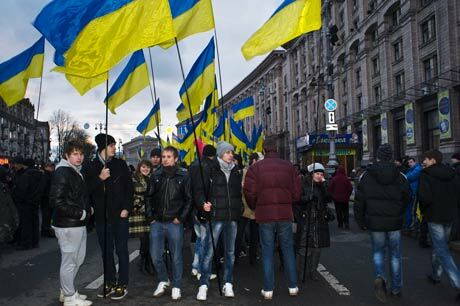 I went to Ukraine by bus last year and all the passengers were polite and friendly. Something seems to have changed. 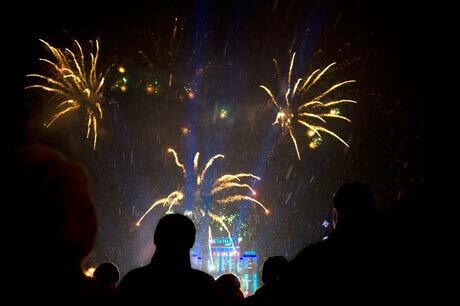 The New Year’s Eve celebration on Maidan Nezalezhnosti in Kyiv had an entirely different tone than the last year when people were dancing, singing and enjoying themselves. This year they stayed quietly on the square, opening their sparkling wine and sipping quietly. 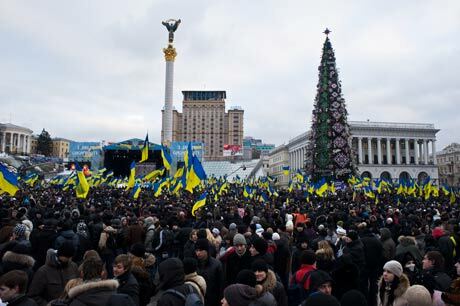 No one applauded when the Ukrainian president, Victor Yanukovich, gave his New Year’s speech and no one seemed excited. The spirit rose a bit when the fireworks started and occasionally someone cried out happily in response to the lights and explosion. The spirit rose a bit when the fireworks started. One positive thing was that the weather was good – the thermometer was on zero. 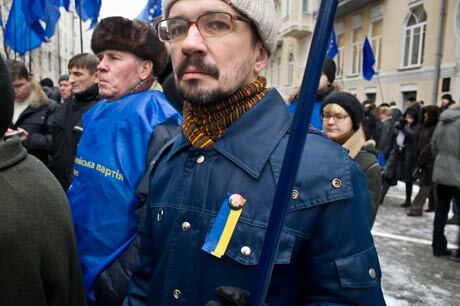 It seems to me that freezing weather in Ukraine is reserved for presidential elections and revolutions. The weather was great all week and on Maidan Nezalezhnosti (Independence Square) Ded Morozes (Grandfathers Frost), Snegurachkas (Snow Maidens), Zajchiky (Bunnies) and figures form different fairy tales encouraged passers-by to take photographs with them. 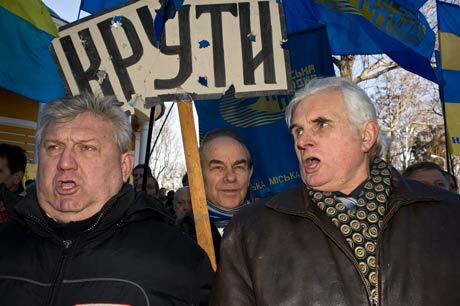 They wanted Hryvnas 30 (USD 3.50). Children could ride on a Merry-go-round or in carnival trains for free. Or they could persuade their parents to pay for pony rides. Those parents who couldn’t afford any of the attractions at least bought a balloon or inflatable toy for their child for 10 Hryvnas. 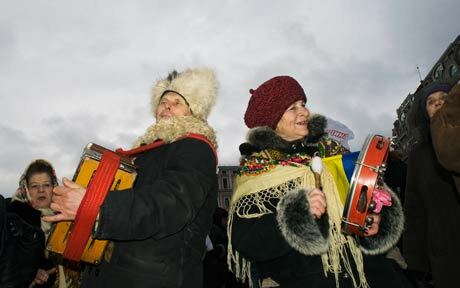 Christmas Holiday on Maidan Nezalezhnosti. 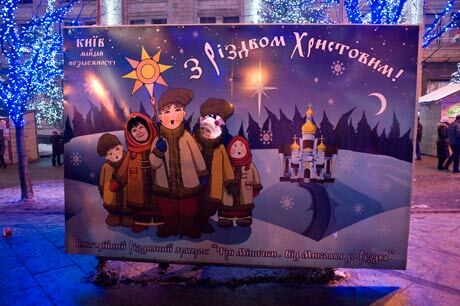 On Maidan Nezalezhnosti the Christmas celebration was in full speed and in the metro underpass babushkas made the best of the holiday as well. More passers-by meant more chances to collect money for their medications. 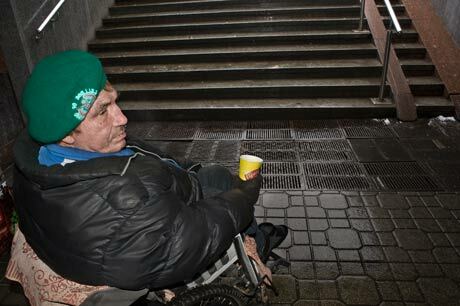 Others were also begging, such as a veteran from the Afghan-Russian war who asked me for money for alcohol. When I asked him about the war, he cried. 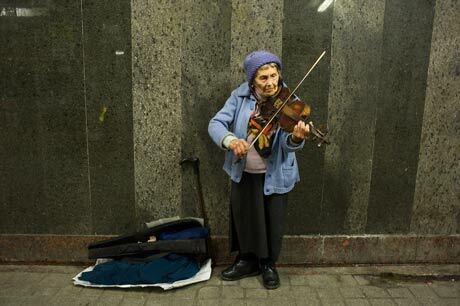 Not everyone was there with extended hands — some babushkas played the violin while others were singing. Some were selling Ukrainian’s art crafts and souvenirs. A woman plays the violin. Veteran from the Afghan-Russian war. 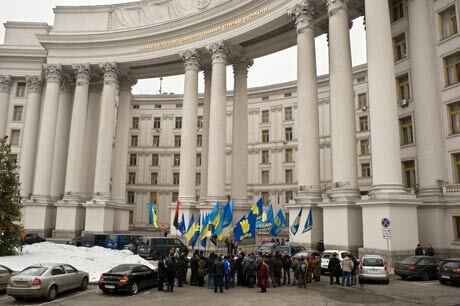 There was a demonstration in front of the Pechersky district court of Kyiv on January 5th where a criminal case has been opened against former Ukrainian Interior Minister, Yuriy Lutsenko. 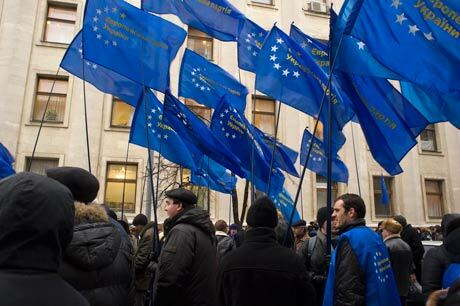 Yanukovich promised he will fight the misuse of power and impunity among members of the State apparatus. But it seems that criminal prosecutions are aimed exclusively at members of the opposition political parties. 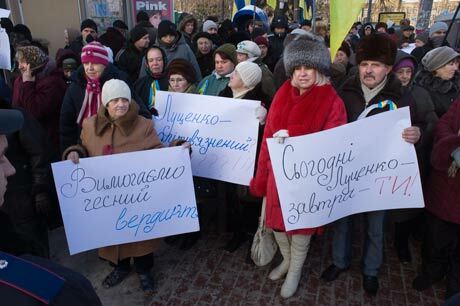 About one thousand demonstrators, mostly pensioners, came to “support” Lutsenko. 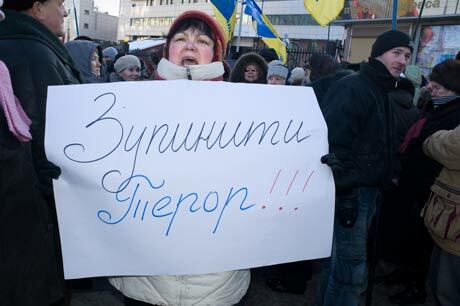 They held banners with slogans like “Today Lutsenko tomorrow you”, “We want fair court of law”. But these demonstrators were paid. 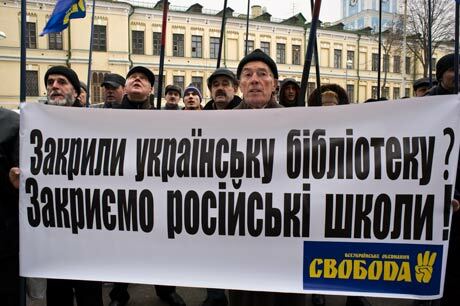 They received about 30 -50 Hryvnas and the person who finds them received 30 Hryvnas and 5 Hryvnas more for each person he brought to the demonstration. 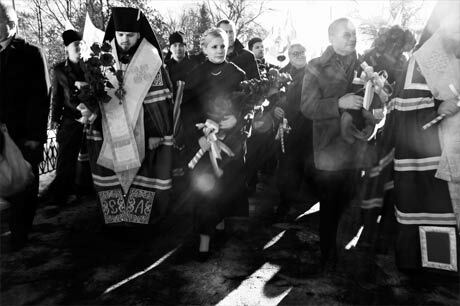 Further, the organizer was paid 100 or even more Hrivnyas. Surprised? Don’t be, it’s normal in the Ukraine. It was very cold this day with the therometer dropping to well below 0. The trial started at eleven in the morning and finished at about two afternon. 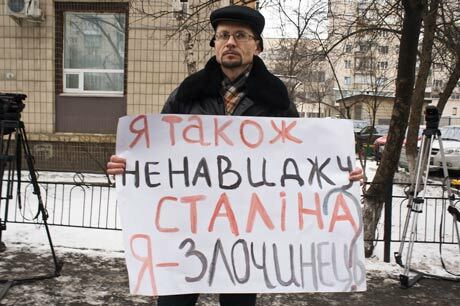 While it was finished for Lutsenko at least that day, the demonstraters had to wait until six o’clock in the evening to collect their pay. 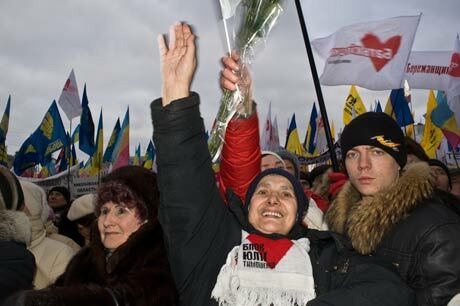 The leader of the Batkivschyna Party and former Ukrainian Prime Minister, Yulia Tymoshenko, also came to support Lutsenko. She was not outside with the babushkas, of course. And it was probably she who paid these demonstrators. Surprised again? 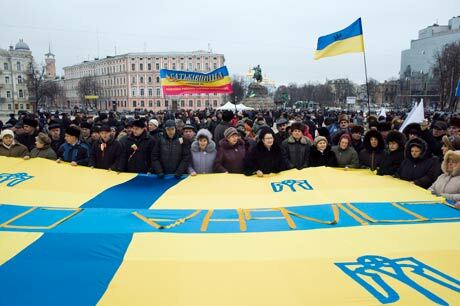 Don’t be, this is normal in Ukraine. 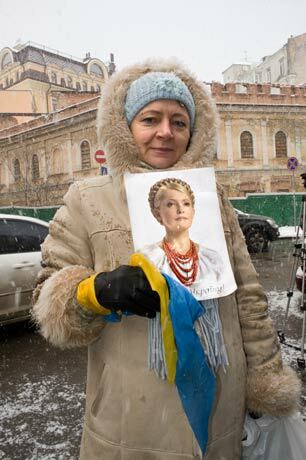 Former Ukrainian Prime Minister Yulia Tymoshenko. Maybe the young generation can change things; maybe the young generation will be more honest. But for now, it seems they are busy with something else.